We’re Celebrating ALL PBCB Volunteers! We are fortunate to have many volunteers with wide-ranging interests and expertise on our team. This month we are shining our Volunteer Spotlight on…ALL OF YOU! On a balmy mid-September evening, we threw a party to thank our many volunteers for their service to PBCB and our communities. All enjoyed a wonderful evening of food, drink, friendship and gratitude for all that we have accomplished together. To see a gallery of photos from the evening, click here. PBCB Wows at the “Celebrate Our Waters” Festival–and Inspires a Local Writer! 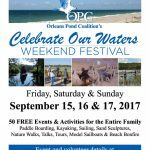 Orleans Pond Coalition held its annual “Celebrate Our Waters” festival on September 15-17, and PBCB played a starring role. During this weekend of free events and activities focused on the beauty of our waters, we were delighted to provide free sailing to 60 festival participants, many of whom had never sailed, been on Pleasant Bay, nor visited our campus. We all had a blast! Cape Cod Chronicle article you can read by clicking here.